Big Bad' Taktikor - FORUM KROSMASTER : Forum dedicated to discussions about Krosmaster. Share all your opinions, ideas and tactical tips! - Test Deployments without physical board, save them and/or print them. - Do some tactical guides with pictures. - Assemble your own map and publish them. - Save all these things as pictures with the size of your choice. Drag'n drop, 8 maps more an empty one, Every Krosmaster, Every invocation, Colour Circles to differentiate them, Digits, Snapping Arrows are some of the features you'll find in that tool. Ok, it comes with a nice help, just click on the blue bomb to discover all functionnalities. All of this in a nearly perfect english just for you =) (Well we'll say i tried ). PS : Do not hesitate to point out my english mistakes. It would be a pleasure to correct them. And to point out any Bug. Huun, This is fantastic! I was worried that I would have to set up example scenarios through setting up the physical board and taking pictures, this is 100x faster. I'll go through the text in the near future if you'd still like an English editing session. I'm really excited to see what can be put together with this tool. I WANT THIS NAO!!!!! I have been working on making some o fmy own maps. if you can make it easier for me Kudos!!!! Fixed a little bug introduced by translation ^^. You can chose your map again. Thanks for your first returns. I'm opened to any help to improve the english rightness of the tool and guides =). How do I download or access it? I was a bit confused when I tried his link at first as well- Ankama has a giant warning flag set up for any links that take you off the forums. But click 'yes' after a 5 second delay and it will take you to a different set of forums, where there's a link to open that opens the actual editor in-browser. I got it yay!!!!! this is going to be so much fun. But is there a way we can add images to the tiles section to create different boards? I can add tiles you designed, but it seems complicated to let you add pictures manually. Not that i don't want, but it's how the canvas is designed by W3C. You can't save a picture if some part of it came from another domain. Ahhh ok. If I were to have you do it there would be A LOT of work for you to do. Was hoping there was an easy way. Now including "Season 2" 's Characters. I hope it'll prove useful to you . UP for the new update ! A link to the tool : LINK. Would it be possible to make the terrain tiles to fall in to their right places automaticly? 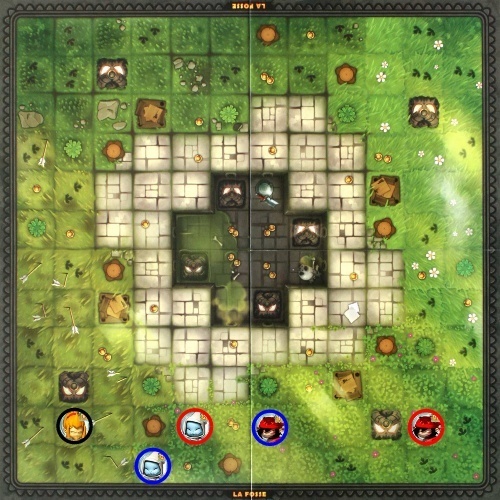 So that there would be a grid implemented in the placing of the tiles, you would not have to finetune the placement manually? I'm not sure to understand, are you talking about the need to drop the Tile before finetuning it manually. Or do you want a invisible grid that you must follow, and so a tile always go the nearest grid slot ? If you see that i don't answer here to a question, do not hesitate to send me a private message. Or do you want a invisible grid that you must follow, and so a tile always go the nearest grid slot ? That would be a great option, that is what I meant! If you start with an empty grid, it is a pain to fine tune each terrain square individually. Damn, i missed your answer so much to do, and not enough time to do everything :'(. Thanks to Wendigo who took the time to make us nice version of online Maps.